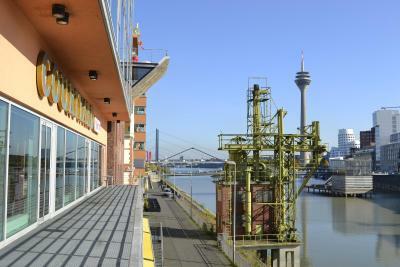 Lock in a great price for Courtyard by Marriott Duesseldorf Hafen – rated 8.5 by recent guests! The hotel is very nice and clean, looks like pretty new! The lobby bar is not bad as well for late drink. The location is very close to walk everywhere in the downtown. The beds were large and comfortable. The location is great if you like architecture. Room was nice, quite clean. 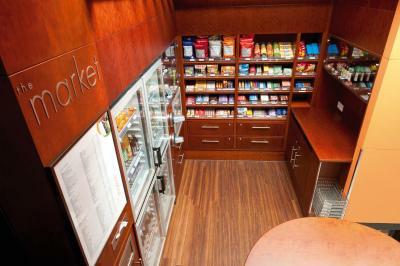 Marriott quality! Breakfast...quite extensive and worth the price. The staff was wonderful. Would love to stay here again on my next visit. Once all the construction is finished it will be nice but the area is a mess at the moment. Great place to stay. Wonderful and friendly staff. Close enough to the main attractions. Clean and spacious rooms. I needed to attend an event at the swanky Hyatt regency down the street and this was the perfect location, at a great price. Great staff, professional and friendly. Eager to solve situations that required attention. The location was excellent! Very friendly and helpful staff! 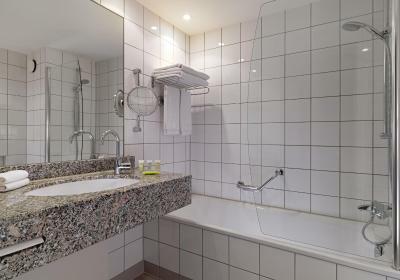 Courtyard by Marriott Duesseldorf Hafen This rating is a reflection of how the property compares to the industry standard when it comes to price, facilities and services available. It's based on a self-evaluation by the property. Use this rating to help choose your stay! 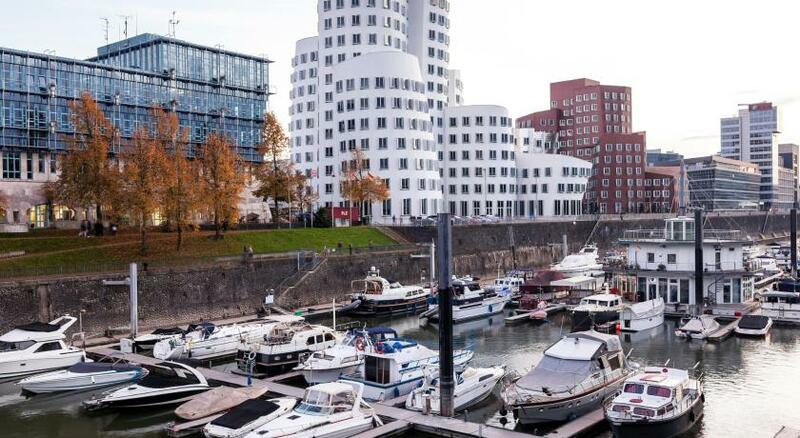 One of our top picks in Düsseldorf.This hotel is centrally located in the harbor of Düsseldorf, close to lively going-out venues, and offers an extraordinary view of the harbor and modern dockland architecture. 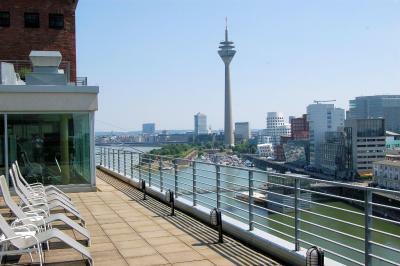 The Courtyard Düsseldorf Hafen offers spacious rooms with high-speed internet access. You can choose between rooms offering a view of the inner courtyard or the harbor. Work out in the fitness center or relax in the spa area on the ninth floor, where you find a view of the habour, a sauna, solarium and large sun terrace. 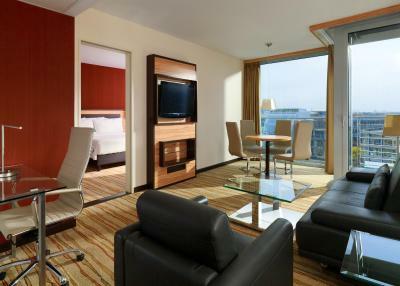 When would you like to stay at Courtyard by Marriott Duesseldorf Hafen? 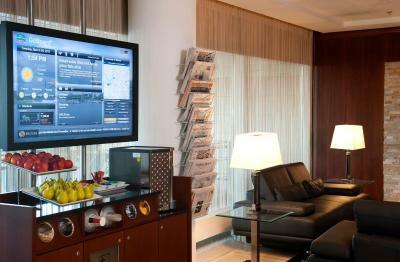 This spacious and bright room offers a view of the Media Harbor. 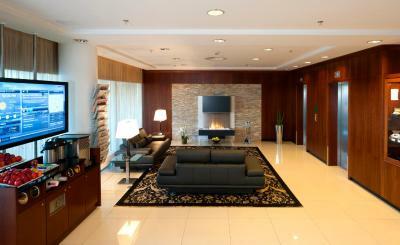 It features a flat-screen TV with satellite channels and an entertainment program. There is also an aerodynamic work desk. Other extras include tea and coffee making facilities and a safe. Guests can choose between 1 large double bed (180 x 79 in) or 2 double beds (140 x 79 in). 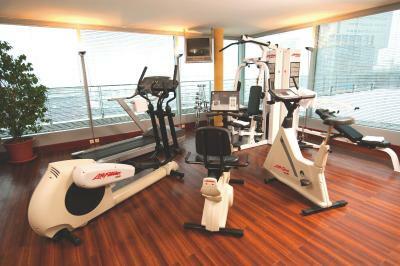 This air-conditioned studio offers a balcony with panoramic views of the Media Harbor. It features satellite TV with international channels, a work desk and a private bathroom with a combined shower/tub and a hairdryer. This spacious room offers a large double bed (180 x 79 in), a flat-screen TV with satellite channels and an entertainment program, as well as an aerodynamic work desk. Other extras include tea and coffee making facilities and a safe. 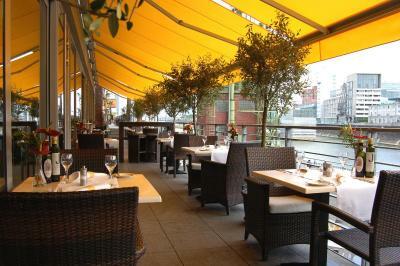 Courtyard by Marriott Dusseldorf Hafen hotel is located in the heart of the trendy Dusseldorf Hafen nightlife district. Walking distance to the city center. Unique Rhine River waterfront hotel. 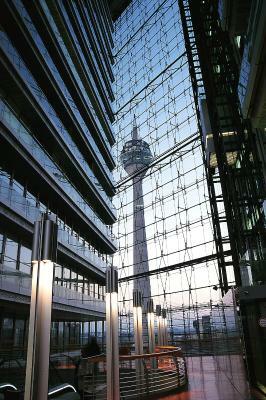 Easy access to the Dusseldorf International Airport. 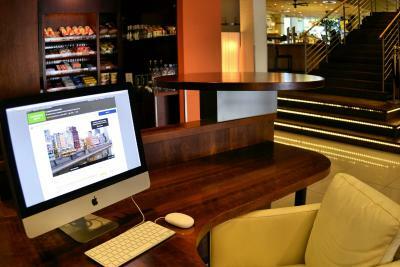 House Rules Courtyard by Marriott Duesseldorf Hafen takes special requests – add in the next step! Courtyard by Marriott Duesseldorf Hafen accepts these cards and reserves the right to temporarily hold an amount prior to arrival. Please note there is a EUR 35 cleaning charge for bringing a pet. A few things: 1. when arrived, the hotel parking was full so we had to search for a parking spot and pay a bit more 2. on checkin, their system got broken twice so it took a bit longer than you'd expect 3. view: there is an active construction - it wasn't noisy (we stayed over the weekend) but we were missing the view.. The elevator requires the magnetic security room card to ride and there were ongoing technical issues throughout my whole stay over two and a half weeks in total. Other guest were having the identical issue and lining up in front of the elevator. At 8.15 in the morning the room setup service suddenly entered the room while I was still in (without knocking, saying hello or anything). To me that’s a clear no go in service. Noisy building work going on opposite the Hotel. Carpark is cramped, stressful to drive in and out. Breakfast is expensive for nothing special. Parking space was tight and very limited. For the additional price of 18 euros per day parking. I would expect better parking space. Rooms were spacious, neat and clean. Very supportive staff. Other patrons at bar were snobby. Construction everywhere. Needed a taxi to Centrum to be around the crowd. Shower & separation bathtub/bathroom could have been better. 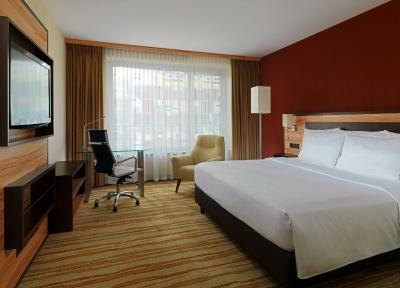 Comfortable, well-equipped room. Quiet. Great breakfast.